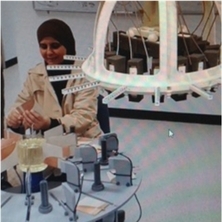 Beadaa Mohammed received her Ph.D. degree in Electrical Engineering from the University of Queensland in 2015. She was awarded B.Sc. and M.Sc. degrees in Electrical Engineering and Electronics and Communication Engineering from Mosul University, Iraq, in 1994 and 2002, respectively. She is currently employed on a UQ Postdoc fellowship in the area of Biomedical Engineering in the School of Information Technology and Electrical Engineering at the University of Queensland, Australia. Her current research interests include developing portable diagnostic tools that can be used to improve human health in the area of brain stroke detection. She received an Early Career Researcher Engineering Grant - Biomedical Engineering “a Philanthropic Research Grant” in 2016. She recently received the University of Queensland Early Career Researcher Grant to further develop her portable imaging system for clinical trials. While being a mother of four little kids, she managed as an early career researcher to achieve great results in microwave medical imaging. Her research is now the core of a new start-up company. Naqvi, S. A. R., Mohammed, B. and Abbosh, A. M. (2017). Fourth order debye model for the skin at the millimetre-wave band using heuristic genetic algorithm. In: ISAP 2016 - International Symposium on Antennas and Propagation. 21st International Symposium on Antennas and Propagation, ISAP 2016, Okinawa, Japan, (896-897). 24 - 28 October 2016. Manoufali, Mohamed, Abbosh, Amin, Bialkowski, Konstanty and Mohammed, B. (2017). Wireless power transfer to a brain implantable medical device. In: 15th Australian Symposium on Antennas (ASA). Australian Symposium on Antennas (ASA), Sydney, Australia, (). 7-8 February 2017. Ahmed, U. T., Mohammed, B. J. and Abbosh, A. M. (2015). Feeding network for microwave hyperthermia treatment of brain tumor using wideband in-phase power divider. In: 2015 International Symposium on Antennas and Propagation (ISAP). International Symposium on Antennas and Propagation (ISAP), Hobart, TAS, Australia, (). 9-12 November 2015. Bialkowski, M. E., Abbosh, A. M., Wang, Y., Ireland, D., Abu Bakar, A. and Mohammed, B. J. (2011). Microwave imaging systems employing cylindrical, hemispherical and planar arrays of ultrawideband antennas. In: Proceedings of the Asia-Pacific Microwave Conference 2011. Asia-Pacific Microwave Conference (APMC) 2011, Melbourne, VIC, Australia, (191-194). 5-8 December 2011.